Not one stray cadaver, save the Aztec Zombie. In hopes that San Nicholas would soon be there. No evil to fight, no one to save. Wishing once more, that he were not dead. As he lay there, on a bed of marigold. As he longed for his heart, back in his chest. A noise atop the mausoleum! By golly, he could see him! Joyous enough to wake all the dead! I kid you not, yes, eight zombie reindeer! Black boots from Tijuana, straight off the shelves! Flying about on a magical sled! “Now Mictlo, now Pepe, now Xotchi and Flaco! On Cucuy, on Quetzal, on Calaca y Santo! More presents to deliver, for me and for you. He hurdled the gravestones with all his dead might! That his present was indeed truly lovely! But something that gave him such wonderful pleasure! Was a large sugar skull, decorated just right! Sensing no loneliness, fearing no harm. “It’s good to be remembered, on this festive evening. A couple weeks back I was contacted by Will Thompson for an interview for the online version of Relevant Magazine. I thought this would be an interesting audience to speak to as they are a faith-based magazine that covers various aspects of pop culture as well as lifestyle and other topics. I always say that El Muerto is a complete reflection of who I am, so check out why a Mexican-American, Catholic, comic book geek/Speed Racer fan/micro movie mogul does what he does! Back in the Glory Days (the 70s), DC and Marvel used to publish large, over-sized comics called "Treasury Editions". They measured at a whopping 13" x 15", and sometimes could be up to 100 pages, in full color!! Most often these were reprints of earlier books, although DC often included more original features in there books. Stuff like 'How to draw Superman' and other DVD-style extras. Included in this gem were the Golden Age origins of the Joker and Lex Luthor (an accident caused Lex to lose all his hair, so naturally he blamed Superboy!). I was mesmerized to learn the origin of the Joker. The 1989 BATMAN movie used the same basic premise (falling into a vat of chemicals) as did Alan Moore's THE KILLING JOKE. This Golden Age story remains one of my favorite comics off all time. I remember seeing this in McCoy's Market. Mom would be in line paying for groceries and I would wander to the Liquor Dept (?) where they kept all the periodicals. I had to have this one! Reprinting, in tabloid size, the original Steve Ditko-drawn first appearance of the Sinister Six! Stuff like this convined me as a kid that Ditko is the one true Ultimate Spider-Man artist! Galactus once again invades Earth, with the intent to devour us all! This time he's accompanied by his strangely biblical herald, Gabriel! Art by Big John Buscema and Joltin' Joe Sinnot. Reprinting classic fist fights between the superheroes (of course, they would usually work things out by the end of the issue. The pulse-pounding battle between Captain America and Daredevil takes place inside the ring at Madison Square Garden! And the Silver Surfer vs. Spider-Man tale was the first and only time Stan Lee got to write his two signature characters in the same story. The Greatest Super-Hero Team-up of All Time! And conversely, the Battle of the Century!! This milestone story was the first time Marvel and DC had collaborated on a joint venture, teaming up their most popular characters in one epic tale. This unquestionably blew me away as a kid. And to this day I'd say probably remains my favorite comic book story, (up there with Amazing Fantasy #15, of course). This book was written by my second favorite Spider-Man writer, Gerry Conway, and illustrated by one of my Top 3 Spider-Man artists, Ross Andru. One of the many reasons I love this book is the cover. I've always had a real affection for comic book covers with white backgrounds, and in this case what better way to bring out the color in these two icons than white? I loved seeing Peter Parker and his girlfriend Mary Jane interacting with Clark Kent and Lois Lane. What really worked for this book was the over-sized pages allowed the stunning draftmanship of Ross Andru to really shine. Andru always was the absolute best artist in comics for breathtaking architectural renderings and panoramic city shots. This stands as his greatest achievement, in my opnion. And what better compliment for an artist than to handle the historic first DC/Marvel crossover? As big as the super-heroes were to me as a kid, printing there stories in these tabloid-size comics only helped create more excitement. My hope is to one day create a Muerto story worthy of this format. 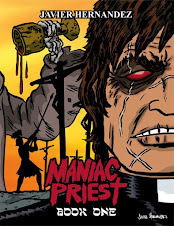 A new story, with a reprint of a lesser-seen story, and maybe a cool 'How to Draw El Muerto' feature. Hold me to this, folks! All these pics were taken from another site, Treasury Comics.com. Created by illustrator Rob Kelly, it's a wonderful tribute to all the treasury/tabloid sized publications from comic's past. Check out Rob's site and treasure these gems! Thanks to Rob for the kind permission to use his pics. So, this would be the 40th Thanksgiving I've celebrated. Well, maybe the first couple were a blur for me, but..... :roll: Anyways, today's was the usual turkey/stuffing/pumkin pie/family get-together. Mom and Dad hosted the day, with me and my siblings and their kids chowing down on juicy, plump, oven-roasted turkey. He had a sketchbook filled with color drawings of baseball and football players. Expressive characters with large chins and their baseball caps/football helmets pushed down over their eyes. He also liked drawing cartoon superheroes like Underdog and Mighty Mouse. Ironcially, we don't remember him drawing characters like Spider-Man , the Fantastic Four , Captain America and the others. The comics he gave me when I was an 8 yr. old lad, the Marvel Comics with art by Kirby, Ditko, Romita, Trimpe, Colan and others are what really created my love for superheroes and comic books. Al told me that he remembers me taking my first art classes in Junior High. By the time High School rolled around I would start getting books from the library on cartooning and drawing. Shortly after he introduced me to comics, he eventually got into sports and building car models, but little Javi hung to the superheroic radioactive soap operas of Peter Parker, Bruce Banner and all the other heroes of the Marvle Age of Comics! And thank God for that, eh?! In many ways, I think Albert may be the proudest one of all. I remember being so happy that he came out one day to visit the set of El Muerto in East LA (not too far from where we grew up). To see him standing on the sidewalk with his daughter as they filmed Wilmer evading a speeding car was a trip. If it weren't for his strong early influence, there probably wouldn't be an El Muerto, comic book or movie! Me and Al after a great Thanksgiving meal earlier today. So, all the love and gratitude to big brother Albert Hernandez. I guess I am one of the 'Hernandez Brothers' after all! I attended an 11 AM El Muerto screening yesterday in beautiful, sunny Santa Monica as part of the American Film Market. The screening was held in an actual theatre this time, as opposed to the private screening rooms I'd seen the movie in previously. This was a great screening because I was able to invite about 30 family, friends and some former students of my Comic Book Workshop. Also, as this was the Film Market, there were various industry folks in the audience. Our head Make-up/Muerto face designer was there, Mark Buatista (another Whittier resident, believe it or not!) as well as our composer, Tony Humeke, who I was able to congratulate in person for his tremendous and atmoshperic score. Among my guests were my dad and my two nephews, David and Christian. Christian helped me out at my table at Comic Con a couple years ago, and will probably be seen helping me out more in the future. Got to train the next generation for the family business, ya know! My mom, older sister and her daughters had come to a previous screening, so it was time to get the other half of the family in on the action. Also in attendance were my older brother, his wife, and my younger sister. My brother Albert gave me his collection of comics when I was about 8. This was a late 60s/early 70s grab bag that included Jack Kirby FANTASTIC FOUR, Gene Colan CAPTAIN AMERICA and DAREDEVIL and Romita SPIDER-MAN as well as Neal Adams BATMAN and reprints of Stan Lee/Steve Ditko SPIDER-MAN. Albert also used to draw his own cartoon characters at the time, which also inspired me as well. Without him and his impressionable influence, there most likely would not be an El Muerto today! And yes, I purposedly positioned us to stand in front of the CASINO ROYALE poster. As a life-long James Bond fan, it makes me very excited to know that I'm following in Ian Fleming's footsteps in having my character make the leap to the big screen! It was great to be in a theatre with a sizeable crowd watching the film. I sat up toward the front, but could hear the audience reactions as the film progressed. During my on-screen cameo I heard my sister-in-law let out a surprised giggle as she saw me, and the cheers I heard for the title credit 'based on the comic book EL Muerto by Javier Hernandez' felt wonderful! By the way, I've created the artwork for the opening title cards. They're intercut with the live-action scenes as the film opens. How much cooler could this experience have gotten?? This was taken at the festival sponsored by AL BORDE, a free spanish-rock newspaper. This event featured vendors, great tamales, music, altars and an art contest, to which I entered my El Muerto serigraph, "El Otro Lado". I actually went in thinking along the lines more of promoting, rather than competing! Turns out the winner of the contest was an artist by the name of Luis Genero Garcia. I remember looking at his painting and thinking I had seen it before, but couldn't place it. At one point I saw him standing next to his painting talking to some people. I approached him to congratulate him on his victory, and commented that I had seen that piece before. He looked over my shoulder and then asked me if I was the artist of the El Muerto print. I began to share with him info on the comic and the movie. Luis told me that he in fact was contacted by my producers a few years ago regarding his painting. Then it hit me like a ton of bones! In the early days of the Muerto deal, my producers, having been introduced to my comic by our director Brian Cox, had looked up El Muerto online and came upon Luis's painting. Later, my co-producer Susan Rodgers met Luis at an event and inquired if he was the creator of the El Muerto comic book! He told them he wasn't, and eventually I ended up meeting the producers and showing them my work. This was back in the days when I still didn't have my own website. Lesson learned! Anyway, so Luis and I are sharing our perspectives on this story in front of our artwork. He commented that is was very interesting that they approached him initially, but in the end I ended up getting the movie deal after all! It was very appropriate, he commented, that a few years later our artworks would be hanging side by side at a Dia de Los Muertos show. He was really gracious, and took a good-natured view of the circumstances. I was actually really glad that he won the art contest that evening. Oh, and another little coincidence, he and I are both residents of Whittier! That's just one of the many unpredictable stories that has come out of my experiences with El Muerto! Most of my adventures with the character outside the confines of the comic book always seem more scripted and fantastic than anything I can create on the page. This has certainly been a very enjoyable and memorable last couple of weeks, believe me! Legendary comic book creator Steve Ditko turns 79 today! Co-creator of Spider-Man, this amazing artist is one of comic's great storytellers. Born in 1927, Ditko's unique stlye literally set the standard for Spider-Man. One of my all-time favorite comic artists, Ditko captured my imagination when my brother gave me his collection of comics when I was about 8 years old. Among the comics where several reprints of Ditko Spideys. For the next 32 years (or thereabouts) I've been in love with his singular vision and individaulistic approach to comics art. By the late 1960s, after having helped revolutionize comics with Marvel's Silver Age renaissance (such as co-creating Dr. Strange with Stan Lee), Ditko abruptly left Marvel for DC Comics. Over the next 20 years or so, he would rotate between the two companies while working on established titles or creating new characters. He also self-published some personal works in the 1970s, establishing himself as one of the first 'indie' artists! In the 1990s onwards, he's concentrated mostly on comics of a personal nature, often creating experimental storytelling devices. Ditko has such a strong independent streak, considering he's co-created one of the most commercially succesful pop characters of all time! When I found out after a few years of creating El Muerto that he shares the same birthdate as the character, I realized that karma does indeed exist! A few years ago, several of my friends asked me why I hadn't written him. I was always in such awe of the man that it wasn't something I thought I could do. But, I realized if I didn't write him, I might regret it later. So, I obtained his address from a friend of mine and wrote Steve Ditko a short letter. Basically I shared with him how much his work has meant to me over the years, and that as a neophyte indie comics creator myself I admired the steadfast individualism he's shown in his career. When I opened my P.O. box one day a few weeks later, my heart literally skipped several beats when I saw his letter. I was actually going through minor hyperventilation as I walked to my car! His letter was hand-written in pencil (! ), with a slight slope as his hand moved to the right side of the paper. He thanked me for my words and also for the copy of El Muerto that I had sent him. Basically he mentioned that all art, regardless of mainstream or self-published, must meet certain objective standards. If you know Ditko, then 'objective standards' is par for course! To this day, that letter remains a treasure. I'm sure he's written thousands of letter, but there's only one he's written to me! My friend Simon appeared with me two years ago at a store signing. I was actually signing on Halloween, and we gave out candy to all the kids who showed up for Trick-or-Treating! Simon actually shows up as an extra in the El Muerto movie (not in costume, of course!). The suit he's wearing was made from one bought at Olvera Street here in L.A. Yes, just like Diego de La Muerte did in the comic. Dia de Los Muertos is celebrated in Mexico on November 2. People gather at the gravesite of their loved ones and decorate it with flowers and mementos that commemorate the departed. Food and drink are put out so that the spirits of the deceased will come back for another meal. Altars are built in the homes with the same effect. It's origins date back to pre-Columbian times, with the ancient Aztec ceremonies blended with All Soul's Day, creating a uniquely Mexican holiday. It's a festival meant to celebrate the life while mocking death, a testimonial to the power of love and remembrance. No sinister motives are involved in the festival. When I sat down and came up with El Muerto, I knew I wanted to capture the spirit of the holiday. A character that would not only be created around the imagery and folklore of Dia de Los Muertos, but one that would also use the rich mythology of the Aztecs. It's nice to be able to particate in Day of the Dead ceremonies, and equally cool to celebrate the character's 'birthday'. 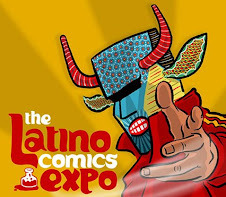 Mexican Independent Comic Book Day! Today in Mexico they're celebrating Mexican Independence Day. Here in cyberspace we're celebrating Mexican Independent Comic Book Day! Coincidentally, it's now the start of Hispanic Heritage Month, so go read some Love & Rockets, take in a Pedro Almodovar movie, or Mambo the night away at a Cuban nightclub! Oh, and read, buy or share some Muerto with friends! I didn't exhibit this year at Comic Con, but I did attend the show on Saturday and Sunday as a 'civilian'. Too be honest, I had a really good time. Mostly I spent the days hanging out at the tables of several friends. I just sat back while they would sell their wares, occasionally covering for them as they took a break. This year I was able to experience the show in the way I did back before 1998, in my pre-publishing days. Kicking it with Michael Aushenker! Of course, I would be asked by many people on why I wasn't exhibiting, or what new comic I was working on, or the most popular question, when was the movie coming out! Well, as my producer told me before I left: "If anybody asks, tell them the film will be done in August". So there you have it! The common topic about San Diego recently is the size of the show and how it's grown monstrously in size. I remember a few years ago when the movie studios started getting in on the act, promoting their films and bringing in the talent for panels and signings. We all feared that comics would be squeezed out. Or at least the self-published variety. From what I hear from many of my associates who couldn't secure tables in the Small Press area, that may be true. But I also have to say that with the recent phenomenon of the New York publishing houses launching graphic novel imprints, and establishing a presence at Con, comics are more in demand than ever. As someone who has benifitted from a film deal himself, I can't argue the influx of the film industry into the Con. 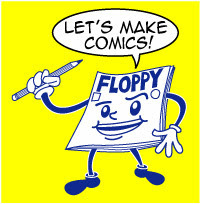 And video game manufacturers also use comics as content for their systems. And I think the amount of fans who come for all these things certainly helps the Con, but maybe, just maybe, they might get exposed to a self-published comic or two. What's I really love about the Con is the sheer variety of things you see and experience there. Panels on Golden Age artists, copyrighting your own creations, Christian comics, and the digital application of comics. You see people dressed as Mexican wrestlers, Galactus, TV characters, and the endless variations of Star Wars personalities. Vendors selling out-of-print art books, home made zines, 1970s Marvel Super-Hero Slurpee cups, and T-shirts featuring just about any character that has ever been draw, animated or appeared in a movie! There are now oppurtunites to make a pitch to a publisher for a graphic novel, submit your portfolio for consideration on a monthy title, showing your work to a video-game company or animation studio, or meeting an actor from a favorite childhood TV show. You can network, sell, buy, collect, play, masquerade, listen, participate or just plain enjoy any umpteen number of presentations, celebrities, booths, vendors, events, screenings, readings, contests, demonstrations, etc. It really has become the nexus of all things cool! If it's comic related, nostalgic, hip and cutting edge, printed, manufactured, animated, painted, sculpted, filmed, digital, audio or whatever, there's a good chance that it came from a comic book or strip. It certainly came from someone's imagination. Created for fun, personal vision or for profit. It's all there for the right price, or just make the time to catch it. And next year, I'll be back, behind the booth. With new Muerto comics. Another new property or two. Various bits of merchandise. And one way or another, that Muerto movie! At attention with Rhode Montijo! I'd like to share two pieces of artwork with you. The first one is an illustration I created last night to accompany an interview I did for an upcoming book about Latino comic book creators. 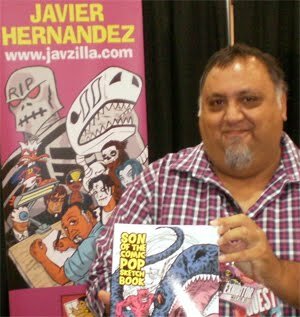 Written by Professor Frederick Aldama, the book features interviews with my friends and fellow cartoonistas Carlos Saldana, Rhode Montijo, Rafael Navarro, among others. (And yes, these fellas are linked off to the right!). Slated to be published next year by the University of Texas Press, this book will, as far as I know, be the first major volume to cover the work of independent comic creators of various Latino backgrounds. I was copy-editing the interview over the weekend, and had to send off the illustration along with the edits. I have to say it was great to be able to have a chance to look over what I said in the phone interview. I've done some interviews where I've read it after publication and thought, "OMG! Did I say that?!" Frederick was a very well informed interviewer, as his questions delved into the individual artist's cultural upbringing and influences, as well as such topics as the 'unique' distribution we have in this country regarding our comics. And yes, I looked over what I wrote about that topic and STILL sent if off!! A great feeling though to be able to actually be a visible part of that particular group within the overall comics industry. The second artwork I want to share is this painting I'm working on. Here's the first pass of paint. Sometimes I start with the figure, but this time the background just called out to be painted first. I don't why I started with the background though. Maybe it was just to see the defining shape, or maybe it was just to see what all that yellow would look like! The reason I picked the color yellow was A) I usually pick a red background when doing a color piece for El Muerto and B) since I was thinking in terms of a resurrection, Easter came into my mind and yellow just seemed appropriate! More blending of colors and indications for wrinkles and shadows. Adding more texture and density to create more weight and really build the figure. I don't claim to have the skill to produce photorealistic paintings, but my personal taste lies more in an expressive creation. In college, lo those many, many moons ago, my first life drawing instructor walked by my charcoal studies and told me "You've got a great expressive style, don't ever let anyone change that." I think I've pretty much let that be my mantra for the last 20 years... As an artist and a person! I'll come back to the painting and tighten up some details, but I like creating these spontaneously to capture that particualr mood in a quick session or two. Plus, I've already started 2 more paintings in the same size and medium. We'll see those later!